An interactive marquee that responds to light or sound intensity? These are the ideas students developed in architect and interactive media designer Biayna Bogosian’s TUMO Yerevan lab. Using GIS data, environmental sensors, Arduino microcontrollers, and Rhino-Grasshopper, teens collected and analyzed environmental data to create dynamic interventions for some of Yerevan’s iconic buildings. 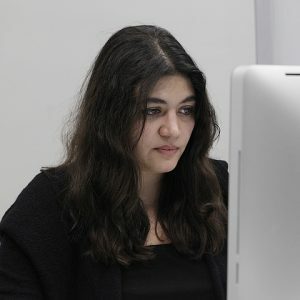 Biayna is an architect and interactive media designer based in Los Angeles who researches perceptual and cognitive interaction design that highlight the relationship between environmental data and the built environment. She is a co-founder of Somewhere Something studio and digital media and architectural design courses at Columbia University.